One of the canvas pieces I did at show to pass the time. I just got home from doing a local home show and my feet are numb! The first thing everyone is asking is, was it worth it? Well that depends...Let's start from the beginning. The second week of March I am approached about having a booth at the area Home and Builders Show scheduled for the first week of April. I have thought about doing this in the past, but just never thought it was the right fit for my business. Mostly because of my location and the type of event that is held here. I have shared booths with others in larger populated areas and helped friends with theirs. However, after hearing recently about some friends having a lot of success at their shows, I decided to give it a try. The booth itself is $789.00 for a 10 x 10 space. The show runs for 5 days 10am - 10pm all but the first day which starts at 5pm. Ok, so I am thinking this is a decent price for 5 days (5 days?) so I sign on the dotted line and get to planning my space. I have decided that the best use of my space would be to buy three sets of bi-fold doors and add a door to each set. I will have one set on each side of my space and have a 6ft table in the back with my business cards, molding and counter top samples and some 8 x 11 table top displays for showing articles my business has been in. I got a 6ft banner to hang from Vista Prints for $10 with their coupon. Surprisingly it rivaled the quality of a friend's banner which cost him $80. Deciding on the type of finishes to do on my panels was the hardest part of all of this. 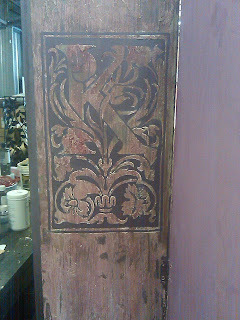 I have to remember that I live in a very conservative area so I can't go crazy doing really elaborate finishes. On the other hand, I want to show people the wonderful possibilities they have. 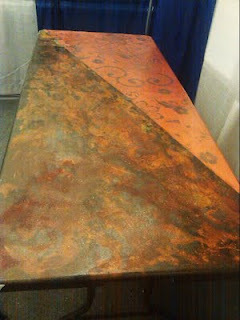 I finally choose some of each and realize during the show that I primarily did the finishes I LIKE doing. Yes, I probably should have done a simple glaze for one, but personally I would rather use a trowel. My bi-fold doors primed and painted. One of the things I don't know beforehand is if both sides of my door panels will show. I know I am between a home and garden store and a outdoor spa retailer, so I just plan on doing all sides and hope for the best. The finishes for the first set of panels will be Stucco Veneziano from Safra Plasters, an elegant Lusterstone finish custom mixed by Sheri Zeman, Faux Design Studio and incorporating a Modello and the third TBD. One side will all be in shades of eggplant and lavender and the opposite side in lighter colors. Note to self, make sure the door panels are stable before applying your Modello! So here I am in my happy world thinking how wonderful everything is going when the panels start to tip as I am applying the Modello. As I am frantically trying to right the panels, my fingers get stuck between the doors and I am left with the choice, save the Modello or save my fingers. I chose the Modello, but alas it was too late, it had folded over like a pancake and was now stuck together. After the tears, brush throwing and #^&@!& I set about salvaging what I could and hence one of my more popular finishes was born. For the lighter side I chose to do a strie pearl finish with a raised design in glass beads, an eco-friendly finish courtesy of Tobias Stucco and a light Old World finish with an embedded design. My next set of door panels I did in a light color Stucco Lux and Victoria Larsen's tree stencil (using same color) since the wall trees have been so popular for me. I did the other side again in an all over tree design, this time in an eggplant color Metallic Plaster by Proceed (the Faux Shop) and white trees. It was very oriental looking and I am kicking myself for not doing the bamboo tree for this side instead. Ok, so what to do with the last door in my first set of doors? Well I decided since I had a lot of product samples that I would just tape off squares and try them all there on the door. My first one was an acrylic plaster from Atova, Paint and Plasters. The second and third respectively were Marmorino Carrara and Marmorino Classic from Stucco Italiano, the fourth Calcenova Arredo and the last was Veneziano Metallo, both by Safra plasters. So looking back on my purchases, I think it is fair to say that the most expense was in getting ready for the show, not the booth space itself. Products, business cards, brochures, signs, carpet rental (next time spring for padded), parking tickets for myself and relief people, meals at show, and on and on. As much as I was conscious of not wanting to have too much clutter up my table, I think I would still not have had half as much as I did. Mostly, because a lot of people were confused as to what exactly it is I do. More on that later! I now have to focus on things to do to draw people to my space. I decide to have a small 4ft table in the front where I can have my table top easel and keep busy doing samples to draw attention to my space. One of the guidelines of these shows is you must have a skirt around your tables and I did a decorative finish on the tops. Just another way of showing what can be done to your surfaces. 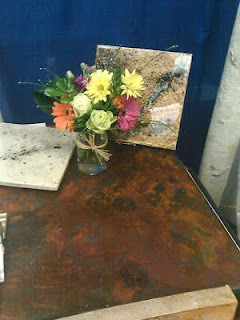 I had a small flower pot with a patina finish and had it full of Dum Dum's so it looked like a bouquet. I think a lot of people came to my booth just for the Dum Dums! I bought 4 bags of outlet covers for under $3 and thought that a good way to pass the time would be to do different finishes on the covers and then give them to people who visit. I stuck a business card sticker to the backs of them. I also brought along canvas and pvc pipe to do some finishes on them as well. The day before I have everything in a pile at a friend's store waiting for the guys to come and haul everything to the convention center. We get everything down there, set up and everything fits perfectly and looks great. All within a couple of hours. 11am and I have gone to the convention center to take a final look around and make any adjustments. During this I get a call from a florist asking if she can make a delivery to my home. Crap who died? All the way home I am wracking my brain trying to think what it's all about. I get home and there awaiting me is a beautiful flower arrangement from a dear lady by the name of Joyce Nelson whom I met in Ohio. The card reads in part, thank you for my website and good luck at your show. What a wonderful way to start the show today! 5pm and here I am waiting for all these excited people to come crashing through my booth to see the wonders of my finishes....6pm still waiting...6:30 still waiting...7pm and interested prospect at last! Oh, the bathroom is down the hall on the right. One thing I am noticing my first day is that I am in a bad location. The room itself is great and in fact probably the best one. But my space is being dwarfed and missed because of the spa guy on one side and the home and garden place on the other. They both have multiple spaces for their business and I just have the one space. From the direction of the main entrance particularly I have noticed (mind you I have now been here for 4 hours) that people enter this room and look directly at the home and garden corner and take in some of the riding equipment then they look to their right at the other side of the hall and they continue to follow to the right until after they have passed me, they then turn to the right and see the spas. I have pointed this out to visiting friends and other vendors who at first eye me with skepticism until they to notice this as well. I have also watched with both irritation and amusement as friends who have come to visit me saunter right past my booth without even looking in my direction. Of the ones who do eyeball me as they are walking past they do a little swerve over for a "feel a finish" before going on their way. This was the slowest day for me. Not much traffic and of the ones I get, half of them thought the tree finishes were painted wallpaper and the other half thought I was selling "fox" painting kits. Is it 10 yet? It has also been brought to my attention that there are not one, but two spelling errors in my business name that was used for all promotions by the production company putting on the show. And...have to explain numerous times that my counter top samples are not tiles that go on your counter top. I have already figured out I should not have brought so many canvas art with me. Most are confused enough by what it is I do and the half dozen canvas that is there is not helping matters. Not to mention that this just isn't the right type of place to be selling canvas art. But oh to be selling mops! Holy cow I cannot believe the amount of people walking by carrying these banana colored mops. The mop guy must be making a fortune! Today is also the day that most of faux experts are here. For instance the lady with the pink hair and orthopedic shoes was kind enough to give her unsolicited advice on how "that guy from HGTV said you should use lots of water when mixing up that paint for your wall." Several have also commented "I can do that" when looking at one of my Rs Crete samples. My feet are killing me and I break down and pay $30 for gel insoles sold by one of the other vendors, who then keeps coming by asking how I like them. A little hard to judge when your feet are already numb! This is the day that I get asked "how did you do that" the most. One determined lady even had pen and paper in hand and was not going to be deterred. Oh alright then if you insist! Today I also bring a chair and I am sitting doing some tree demos on pvc pipe. This more than anything is a huge hit. People just love to see someone with their hands full of plaster slopping the stuff on a pipe. Did that sound wrong? Today our UMD college hockey team is in the midst of winning the national finals so it is really slow here. Like echo slow slow slow. Nuff said. Good news! My feet hurt so much today they don't hurt anymore! Yipee! Ok, I figured out another goof. I should have taken down the names of prospective clients. I know better and I didn't do it and now it is too late. I also know something else. 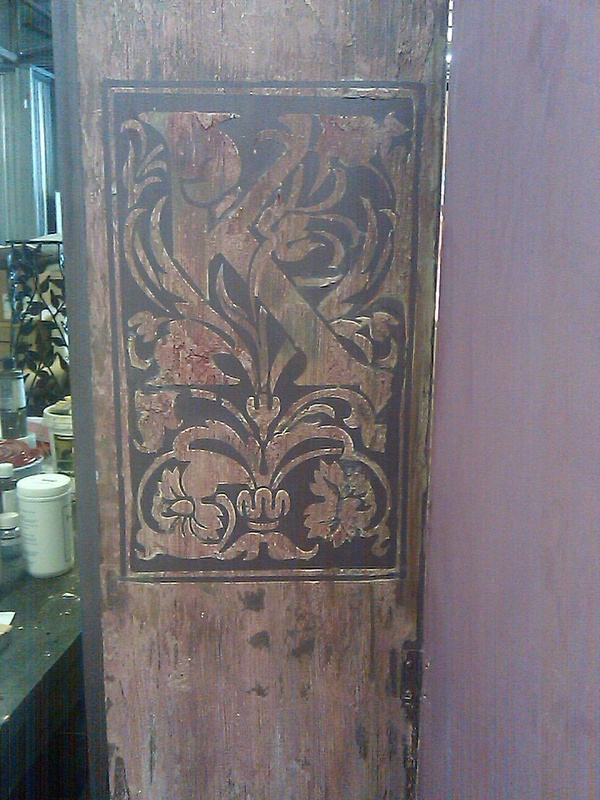 Although it was a good idea to do finishes on bi-panel doors, many people think I am selling decorative screens. Duh! Why didn't I? Time to get the bleep out of here! My help has arrived and I can pack up and go home. Here is something I bought at Jerry's Artarama for displaying my sample boards. This also works very well for canvas art and hides my tuna sandwich when prospectives visit. Ok, so again, was it worth it? My business used to be very busy. I had people working for me, I was booked consistently and I could be really choosey about the jobs I took. 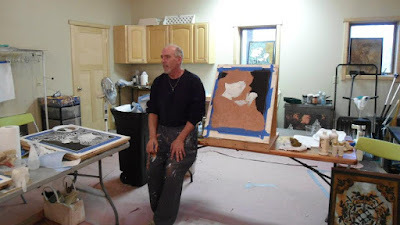 Then I spent almost 5 years marketing and promoting other decorative painting businesses and schools, to the extent that my own business was badly neglected and calls were less frequent. So for me, I was looking to promote my business and make those much needed connections to other people and businesses. Plus, sometimes I think it is just good to connect with some that you normally wouldn't. It can bring new opportunities that you wouldn't normally have. I guess time will tell if it really was worth it. Day after show end. In pj's all day, wiped out from the 5 day marathon! Feeling coming back to my feet. Unpacked my boxes. Found other half of my tuna sandwich. Wondered wth that smell was! Poor Kathy....I've done enough trade shows to last a life time and do know the pitfalls and pains! One thing I did learn was to show before and after photos and finishes and rooms. A counter top half done, a cabinet door 1/2 done, a wall 1/2 done. It helps and might be a thought for future shows should you decide to do any. I do love, love, love what you did with the Raised Plaster Aspen Tree Stencil on the screen. Just gorgeous! You are very talented. Every experience is a learning experience. You are a exceptionally talented lady who continues to grow with everything you take on. I love seeing all the new and exiting things you are always learning. Best of luck Jan, NOT that you need it. I did one and got NOTHING out of it..and followed up on my leads TWICE. They might work better for mop folks. I was more than a little hesitant to do this, but so far I have gotten two calls from it. I found the piece you did at the show to "pass the time" quite lovely. I'm wondering how out of my range you are, because I'm assuming you are, but just for a giggle, how much is it? Thank you. I sold it for $65. Hi Yvonne! It was not worth it for me. Location has a lot to do with it. Others I know in different areas have had great success so check with others in Ohio. This is some serious work. I love it. How long have you been doing this Kathy? ?